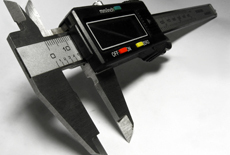 We're always looking for ways to improve the quality of products, and our relationships with suppliers and customers. So in 2009, we launched the Vendor Quality Program, a partnership/feedback system with our 10 largest parts suppliers that improves quality, on-time delivery and communication, and nips quantity errors. To let our suppliers know where they needed to improve, we invited teams from each company to visit us and go over everything they were being judged on, rather than blindly sending them a report card. "It's important for each supplier to know every single metric they're being judged on," said Ralph Jackson, Hamilton's assistant plant manager for lean and quality. "So when we brought each supplier in, we went over all of our expectations and used their input to shape the grading criteria." In the past, two areas that needed massive overhauls were communication and on-time deliveries. For example, if a large supplier couldn't fulfill an order and didn't notify us of the mishap, then we'd be left without delivering a product to our customer. Everyone lost. "It's a big loop," said Jackson. "And it's definitely been positive for us, our suppliers and our customers. We now know exactly how we depend on them, and vice versa." Because of the success of the program, we're able to maintain lower inventories, so there's less possibility for waste without sacrificing delivery times. And ultimately, we've zapped many of the problems in the past, like quantity errors and missed deliveries. The program strengthens our relationship with vendors because the level of communication is more frequent and always related to objective performance criteria. The Vendor Quality Program is part of our continuing lean mission to improve manufacturing quality while reducing waste. Although Americans are bad at soccer, they sure know how to manage a company, according to research published in the Harvard Business Review. For 10 years, a team from Harvard Business School, London School of Economics, McKinsey & Company, and Stanford surveyed global management and found that although every country has top-tier firms, the majority are born and raised in the United States – especially manufacturing. • The U.S. dominates in manufacturing, retail and healthcare sectors, followed closely by Japan, Germany and Sweden. The researchers found that China lags at the bottom of the management charts. Most European countries were in the middle. • Organizations with better management devour their disorganized competitors. The superior companies make more money, grow faster, have higher stock and survive longer. • The key to success is ruthlessness. 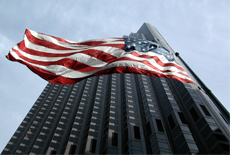 Because the U.S. has tougher competition, Americans constantly reward and promote high-achieving employees. Likewise, they sever the ties with the bad ones. • Human capital is indispensible in the U.S. More Americans get into college than other nations, and with flexible labor markets, it’s easier to hire and fire employees. Read more about the team’s research on the World Management Survey on manufacturing. 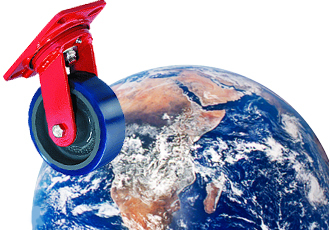 83,758,878: That’s how many revolutions it would take for our 6-inch caster to go around the earth. Because it’s our most popular wheel, you could easily find it in every corner of the world. 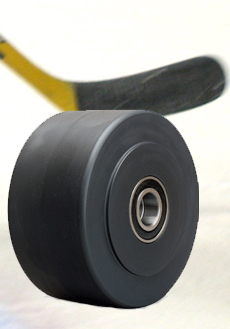 In honor of the Stanley Cup that just wrapped up, we’ve pitted our Nylast™ wheels against NHL-regulation hockey pucks. Although these wheels look pretty darn similar to the frozen projectiles, the similarities stop there. Nylast™ wheels are made from solid-cast, high-performance nylon that’s injected with finely divided particles of molybdenum disulphide (MoS2) to handle heavier loads. NHL-regulation pucks are made up of vulcanized rubber with antioxidants, bonding materials and chemicals. Similarly to our nylon wheels, hockey pucks are composed of chemicals to maintain their resilience. In this case, big burly men slapping it around at 100 mph. Our Nylast™ wheels handle temperatures from -30° to 220° F, and melt at 420° F. They’re designed to run in frigid temperatures and resist moisture and chemicals in much hotter, corrosive environments. Hockey ice is kept at 16° F, and during games, teams store pucks in freezers to reduce bounce. And because hockey pucks are made of vulcanized rubber, they’re also virtually impossible to melt, freeze and distort. We purchase our raw nylon domestically and machine our wheels here in our Hamilton, Ohio, factory. Hockey pucks, on the other hand, only get abused on the ice in the U.S. They’re manufactured in Canada, Russia, China and the Czech Republic only. Australia takes the crown when it comes to creating the world’s largest donut, which is really just one massive donut, made of 90,000 sugary minions. 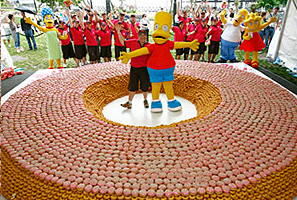 Forty employees from Donut King worked for nine hours to craft the doughy masterpiece. They used half a ton of pink icing and 66 pounds of sprinkles to construct the 20-foot, 4-ton behemoth. And none of it went to waste. The restaurant donated the donuts to charity, after posing for pictures with Bart and Homer Simpson, of course. When the manager of a large regional warehouse was evaluating casters and wheels for his daily operations, he searched for the optimal solution from every caster manufacturer. After careful review, he decided upon our S-WH-8SPB Workhorse Caster with Poly-Soft® wheels. The caster was perfect for his needs. It was rugged and quiet, and it rolled easily under heavy loads. Not only did he place a huge order, but also he called his company’s merchandise manager to find out why the caster wasn’t in their catalog presentation. 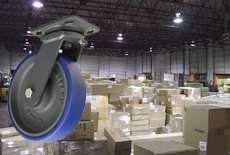 The Workhorse Caster with Poly-Soft® wheels is now hugely popular in warehouses around the world. Read the specs on our website.